Last Tuesday, the Hartford Police Department posted a picture on their Facebook page that shows graffiti on the Dothan Brook Elementary School. It reads “AMERICAK.K.K.ANS FOR TRUMP," referencing the Ku Klux Klan. In their post, the police department asked the community to help with any leads, but the rhetoric on the Facebook thread is reflecting a wide range of reactions as the 2016 general election draws near. A reference to the KKK on the facade of an elementary school is hardly the only form of racially-charged speech to come out of this election cycle. The black spray-painted words in Hartford were washed away by the Dothan Brook Elementary School, but not before the community tried to decipher the meaning of the message. One Facebook commenter speculated the culprit was a Hillary Clinton operative, trying to make Trump supporters look bad. Recently, there have been similar accusations about violence incited at a Chicago rally. Donald Trump spoke about it at the final presidential debate last Wednesday night. "They hired people, they paid them $1,500, and they're on tape saying be violent cause fights do bad things," Trump said. On other side of the isle, one Facebook commenter suspected that the vandal is "one of those deplorables," a reference to a speech Hillary Clinton made earlier this fall. Phil Kasten, chief of the Hartford Police Department, says the person who wrote the message was probably just some kid. 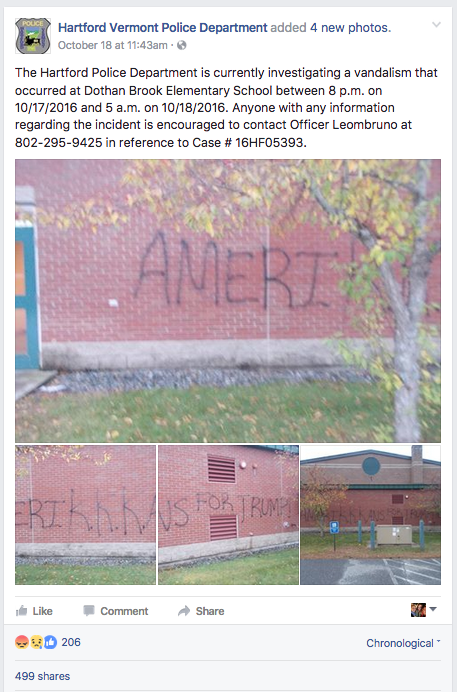 "The graffiti has referenced certainly the election along with many other things that appear to be the ramblings of juveniles that are engaged in youthful mischief that unfortunately has caused a significant amount of damage," Kasten said. This was the second instance of this type of political vandalism to happen in the town this month. And on the same day it appeared, in Mississippi, 50 bullets were shot into an Emmett Till memorial. Linda Fowler, a political science professor at Dartmouth College, says that according to surveys, this election has spurred a radicalization of the political parties. Fowler does not think that all Republicans or all Democrats follow this model — but the trend is there. And with just over two weeks until the country picks its new president, Vermont is not immune to the nation’s conversation about racism and skepticism. Democrat Hillary Clinton and Republican Donald Trump face off in the final presidential debate Wednesday night at the University of Nevada, Las Vegas, and NPR Politics is live-annotating the debate. From Tuesday Oct. 25 through Thursday Nov. 3, VPR will host debates for statewide offices – and we want to include your questions in each forum. With incumbent Bill Sorrell retiring, Vermont is getting its first new attorney general since 1997. Voters will decide who oversees law enforcement in Vermont, and who defends Vermont’s laws from legal challenges. VPR producers Annie Russell and Liam Elder-Connors break down the race for Vermont's Attorney General. If all you have are just a few minutes to think about this race before voting, spend it listening to this audio and scanning this Time To Vote page.